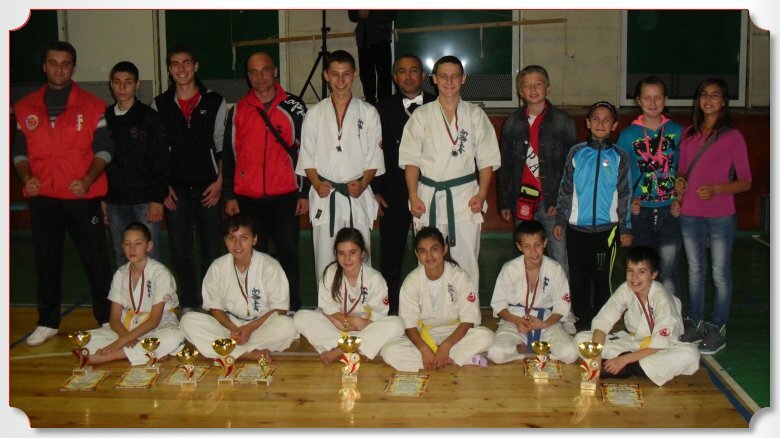 On 24.11.2012 in the "Mladost" hall in Burgas took place the National "Cherno More" cup tournament in Shinkyokushin karate for juniors. In the competition, which was perfectly organised by the hosting team, took part many of the young talents of the Bulgarian Karate Shinkyokushin Federation, hailing from clubs of the whole country, among them also standing competitors of the Junior National Team. SC "Kyokushin" Shumen's competitors, with chairman senpai Stoian Obretenov- IInd dan, fought well, winning a gold and a bronze medal. In junior girls in the 55kg category Ivelina Petrova won the title by defeating the bronze medalist from the European championship for kadets Krasimira Mireva of KKC "Kanku-kai" Sofia in the semifinal. It was a very close match and only after regular time and two extensions did the referees rule in favor of our competitor. In the finals Shumen's young hope overcame the much more experienced Denitza Georgieva of KFI "Bushido" Nesebar. Ivelina normally competes in kadets, thus her title was a great accomplisment for Shumen's team. During 2012 the young fighter has grown a lot in her game and deservingly became republican champion in juniors, also winning two first places in National cup tournaments in kadets and juniors and a second place finish in the ROMANIAN OPEN - EUROPEAN CUP in kadets. A bronze medal in the 65kg category was won by Osman Osman, who trains under Aidan Ahmed in the branch-club of SC "Kyokushin" in Tzarev Brod in the "St. St Kiril and Methodii" school. In his first match Shumen's karateka overcame Nikolai Georgiev from ASKC "Trakia" Plovdiv, but in the semifinal he was paired up with the european champion Andrei Rusev from KFI "Bushido" Nesebar and even thought our fighter lost by decision, he fought very well showing great fighting spirit and mental stability. In the third place match Osman was again the better fighter and deservingly won his place on the steps. The competitors of SC "Kyokushin" Shumen continue their preparation for the upcoming exam for a higher level of technique (kyu), which will take place in January 2013 in Shumen under the guidance of the Technical director of the Bulgarian Karate Shinkyokushin Federation, coach of the National men and women's team and Branch-chairman of Bulgaria shihan Georgi Popov Vth dan. 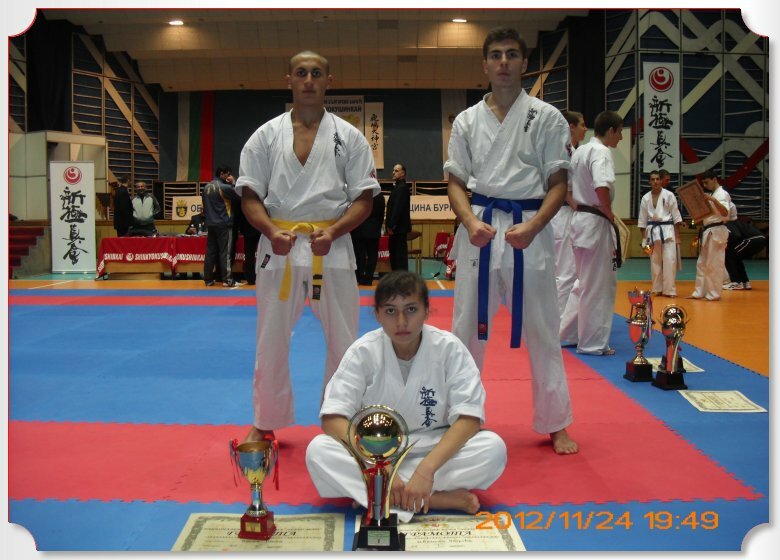 On 16-17.11.2012 in Kielce, Poland was held the European tournament in Shinkyokushin karate for kadets, men/women up to 22 years of age and men/women in absolute category in kata and kumite. 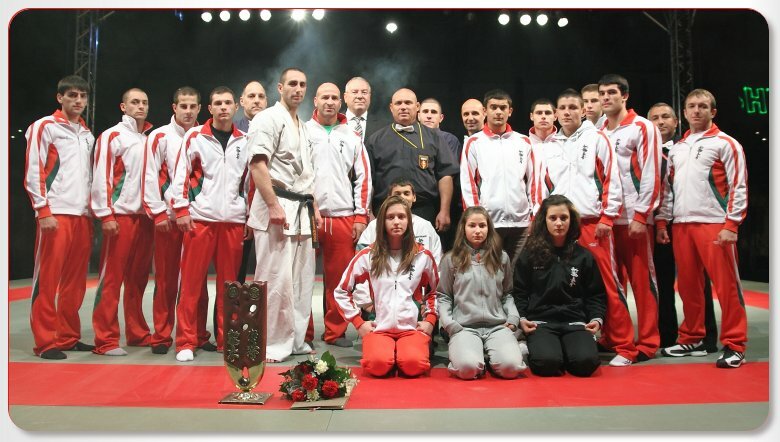 The National teams of Bulgaria performed well, winning 2 gold, 1 silver and 5 bronze medals. In the absolute category for men sensei Valeri Dimitrov - IIIrd dan destroyed all his opponents with vazaari or ippon and became european champion for the 11th time (an unprecedented event in Kyokushin karate history). The other title for Bulgaria was won by Denitza Georgieva in kadets kata. A second place was awarded to Ianitza Stefanova in the U-22 65kg category. 1.Vasil Vangelov in the U-22 +85kg category. 2.Lachezar Dimitrov in the U-22 65kg category. 3.Artemii Dobrinin in the kadets 70kg category. 4.Darina Mihova in the kadets 55kg category. 5.Krasimira Mireva in the 55kg category. Shumen's national team member in kadets Mark Chervenkov made a very strong debut, winning his first match with vazaari after a well placed djodan mawashi geri against his opponent from Litva. In his next fight he was paired up with a Ukranian competitor and our karateka proved stronger, but with 10 seconds to go his opponent simulated a foul and unfortunately the referees punished Shumen's fighter and he unfairly lost his chance of a medal, having to accept 5th place in the standings, but showing that he has the quality to go much further. The board of SC "Kyokushin" Shumen deemed this an excellent performance. The competitors of SC "Kyokushin" Shumen continue their preparation for the National "Cherno More" cup, which will take place in Burgas on 24.11.2012. On 03.11.2012 in the "Vasil Levski" hall in Pazardzhik took place the National "Pazardzhik" cup tournament in Shinkyokushin for kadets and children up to 12 years of age. This year the tournament was exceptionally strong and the audience saw many close matches, in which the young karatekas from clubs of the whole country showed their technical growth, will to win and preparation. For a consecutive time this year a very strong performance was made by the competitors of SC "Kyokushin" Shumen with chairman senpai Stoian Obretenov - IInd dan. They won 4 gold and 3 silver medals and the award for the best technique went to Shumen's Ivelina Petrova. 1.Emil Bachev in the 12 years of age 35kg category, who won his semifinal with avasete ippon after a very well placed djodan mawashi geri. 2.Kaan Shukri in the 12 years of age 41kg category, who took his semifinal with vazaari and his final with ippon. 3.Arzu Fikretova in the 12 years of age 38kg category, who won all her matches with vazaari. 4.Ivelina Petrova in the kadets 52kg category, who was a class above her competition. She defeated Viara Koikova of KKC "Ronin" Gotze Delchev with vazaari after a strong series of punches and chudan mawashi geri and in her final she won over the home team SC "Tornado" Pazardzhik's Tsvetelina Ivancheva by decision, also receiving the prize for the best technique in kadets. 1.Engin Mustafa in 12 years of age. Ahmed Sabri, Serpil Galib, Plamen Rusev and Dimitar Hadzhiev also fought very well, but fell just short of reaching the medals. The competitors of SC "Kyokushin" Shumen could take part in the National "Pazardzhik" cup tournament in Shinkyokushin karate for kadets and children up to 12 years of age thanks to the Municipality of Shumen. Shumen's karatekas continue their preparation for the upcoming European tournament for kadets, which will be held on the 16th and 17th of Novermber in Kielce, Poland.